Sticks and stones never looked so good. Sticks and Stones may break my bones, and render my lawnmower useless. Not quite the child’s rhyme, but with soil that heaves up glacial rubble and trees that sneeze sticks, I’m constantly dodging the byproducts of Mother Nature’s whimsies, and as a result working on ways to dispose of or sequester them. My solution: sticks in jar with a little functional garden art on the side. Drink needed: Boz delights in having 42 new things to lift his leg on. 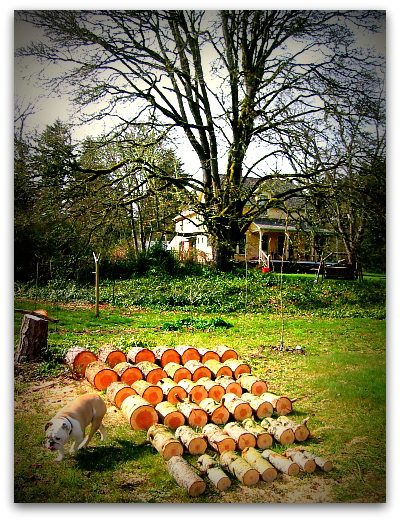 It all began when I cut down a rogue fir tree in my orchard. After lowering the stump height and removing the firewood, I was still left with some troublesome obstacles. My orchard was the North Atlantic, my riding mower the Titanic, and the stump and surface roots my not-so-hidden icebergs. I wanted to find a way to avert mower disaster. Placed a large garden pot on the stump. Leveled it with shims underneath its base. Filled the bottom third of the pot with stones for stability. Added large branches and sapling sticks to the jar. 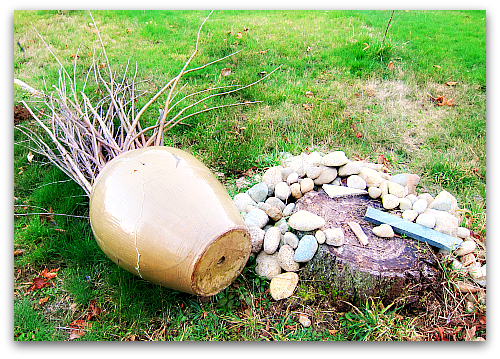 Collected yard stones and piled them around the stump. Stepped back and admired my handy work. Here’s why I did it. I now have a centralized supply of garden stakes. I also have a place to store rocks that I remove from the yard (and ready for countless other DIY projects). Few stones in the yard means fewer mower mishaps. It’s a good use of a cracked pot that couldn’t hold soil and plants. Oh yes and a word of caution: make sure you put enough stones in the pot for ballast, as the first strong wind will treat the branches like a sail and show you who’s boss. 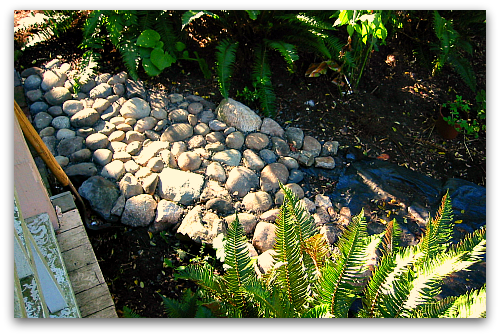 Stay tuned for little tutorial on how to build a stone path. Yep, rocks are my most productive crop. I fear I have more rocks than projects in which to utilize them (for now). I love it! It looks beautiful in your garden! Well done! Thanks for the tutorial too! Brilliant! I need to follow suit as we “grow” far more sticks than we do anything else. Your arrangement looks wonderful, Tom. Very cool that it’s also so functional and solving a problem! Clever, very clever. I particularly like your last reason. As for the stones, wish I’d known about ’em before I paid for a bunch to adorn the shower floor in our new house. Ha. I see a set of nice garden chairs! Tom – such a great idea! We too have lots of rocks in the garden. We built a fire pit with huge rocks dug up from a bull dozer when we went onto municipal sewer. Then with extra smaller rocks, we lined perennial flower beds. Love your creative touch in the garden! Love the stones. I remember my mother always gathering stones and filling my father’s car trunk full of them on vacations to the Great Lakes; hauling them home to surround her flower beds. You sound like me – finding uses for the simple things in the yard! 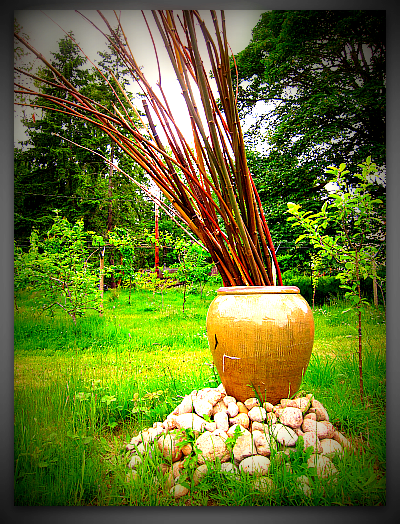 LOVE your idea though – sticks in a decorative jar = YARD ART! Beautiful! I use all of my twigs and branches and such as borders in my garden beds. Over time they’ve started to look nice and sturdy and twisty, and I don’t have to deal with branch disposal. Necessity is indeed the mother of invention…love it!